Shearwater’s youngest residents can look forward to attending school in the highly-rated St. Johns County School District. Shearwater is zoned for Timberlin Creek Elementary, Switzerland Point Middle School, and Bartram Trail High School. Each of these schools received a prestigious “A” rating by the Florida Department of Education School Grades program. Timberlin Creek Elementary, an excellent school adjacent to Shearwater, recently received the Florida Department of Education’s “Golden School Award” and the district Five Star Award for parent and community involvement. Teacher to student ratios are approximately 1:16 for Pre-K through 3rd grade, and 1:17 for grades 4-5. Learn more about Timberlin Creek Elementary School. 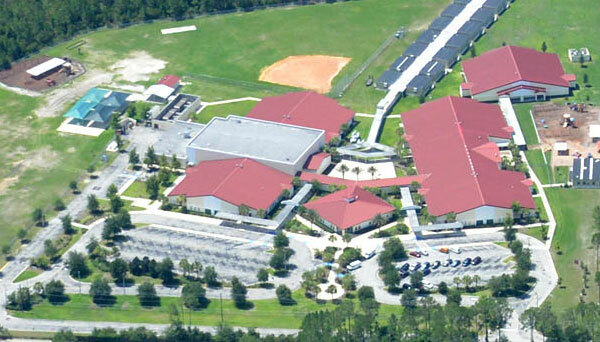 Switzerland Point Middle School serves grades 6-8 and is located in St. Johns County. The school seeks to empower all students with a passion for learning and deep empathy for others. Each student’s strengths, talents, and creative abilities will be recognized and nurtured. Switzerland Point Middle School was recently selected to participate in the Florida Middle School IT Career Academy Technical Assistance Program, which prepares students with the skills necessary to work in the technology sector. Learn more about Switzerland Point Middle School. The VyStar Academy of Business and Finance – An academic and internship program for students interested in exploring career opportunities in entrepreneurship and financial services. The Design Academy – A rigorous and relevant Science, Technology, Engineering and Math (STEM) program which focuses on one of three concentrations: Interior Design, Fashion Design, or Architectural Design. Bartram Trail High School is committed to both academic excellence and athletic achievement. In the 2014-2015 school year, Bartram Trail offered more than 20 AP courses, ranging from Art to Statistics. The Bartram Trail Bears were district champions in five sports, regional champions in boys tennis, state runner-up in baseball, and state champions in cheerleading. Learn more about Bartram Trail High School. Owning a new home in Shearwater offers the opportunity to be a part of a community where families can thrive, grow, and learn. If this sounds like it might be the right community for your family, sign up to join the Founders Club to receive email updates about Shearwater, invitations to special events and other news.